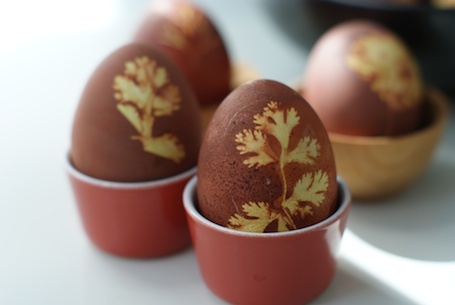 For this year’s seder, we decided to take our eggs up a notch. It was a last-minute decision, actually. Late Thursday night, we realized we had used up all the eggs for the cheesecake and didn’t have enough to bake overnight (oops!). I was looking around for other options and stumbled across a shorter, stove top recipe on The Kitchn, solving our problem of time and had the added feature of these gorgeous stenciled decorations. Start by dipping your egg in water, which will help the leaf stick to the surface. Apply leaf of choice. We used parsley and cilantro. 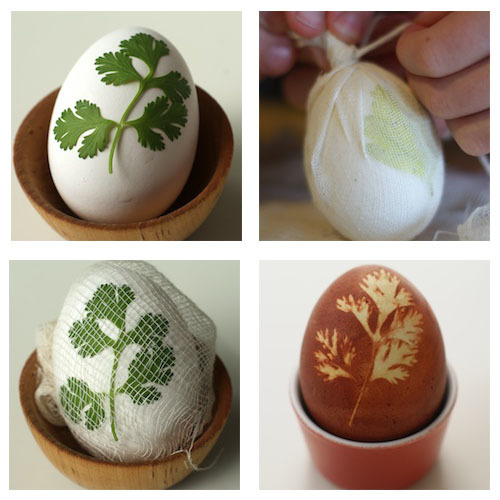 You are supposed to then put the eggs into some pantyhose as the elasticity will hold the leaf in place. We didn’t have any, so we used cheesecloth and tied it with a string. Before starting on your eggs, take the onion skins and put them in a large soup pot. Cover with water and put on stove. While it is coming to a boil, you can wrap your eggs. Once the water is boiling, turn it down to a simmer and add the coffee grounds, peppercorns and vinegar. Then, using a tongs, slowly lower your wrapped eggs into the simmering water. Once all the eggs are in the water, pour about 4T of olive oil over the top. Cover and simmer. After about one hour, we turned the heat off and let the eggs steep for another couple of hours. That is probably more than enough time. The key is to make sure the eggs get a nice, deep color and flavor, but without completely decimating the yolk (still experimenting with this ratio). When you are ready to unwrap them, set a small bowl in the sink. Take two or three eggs at a time and run them under cold water until you can easily handle them. 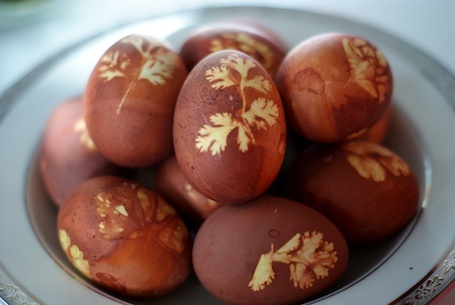 Use scissors to cut away the cheesecloth or hosiery and underneath the mess, you should have a dozen gorgeous eggs! It was almost a shame to peel and eat them that night, but they were delicious (as good as the oven variety). We don’t do Easter eggs in our family, but this has the same appeal and will definitely become part of our tradition. Think of all the design possibilities! This entry was posted on April 7, 2012, 10:55 am and is filed under inspiration. You can follow any responses to this entry through RSS 2.0. You can leave a response, or trackback from your own site. Those are some photo-worthy eggs. I saw nothing like this at our Arizona Seder. Happy and healthy Passover. These are gorgeous. I am sorry that I did not see this before Easter…maybe next year? I have nominated you for the Versatile Blogger Award http://shellybyceinteriors.com/2012/04/08/versatile-blogger-award/ because I think your blog is really cool! Wow. Thanks! I have been wrapped up in WordPress transfer issues, but I would love to participate! Appreciate the shout out! Those are gorgeous! I’ll have to make myself a reminder to make those next year for my Seder. They were so easy, too! Chag sameach! You are ridiculously talented! Those are gorgeous!